It was a special occasion when companions and guests of Ormskirk Priory Chapter No 4007, gathered at Ormskirk Masonic Hall, to witness the installation of Christopher Cullen as their new first principal. For the installation the chapter was very pleased and honoured to welcome Colin Jenkins, the representative of the Grand Superintendent. Pictured from left to right, are: Colin Jenkins, Christopher Cullen and Dean Scrutton. Colin was accompanied by Ormskirk and Bootle Group Chairman Graham Chambers, group vice chairman Malcolm Alexander and acting Provincial Grand officers. After the chapter was opened and the initial business had been completed the director of ceremonies, Andrew Clarke, announced that Colin Jenkins was without and sought admission. 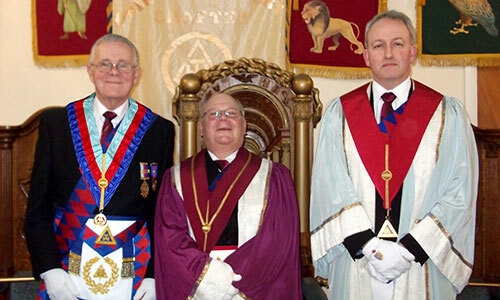 Colin was then brought into the temple in a procession, accompanied by grand officers and the acting Provincial grand officers, David Coulson and Barry Dearden. After Colin was warmly welcomed by the three principals to the chapter, the installation ceremony commenced, with Christopher Cullen being installed as the first principal of the chapter by the outgoing first principal Paul Dooley, with Dean Scrutton being installed as third principal by William Hunter. The second principal elect, Colin Higginson, was not present and will be installed at the chapter’s next meeting. The scarlet robe address was delivered by Frank Cullen and the blue robe address was delivered by Paul Dooley. At the conclusion of the ceremony Colin brought the greetings and congratulations on behalf of the Grand Superintendent Tony Harrison, congratulating the three principals and all the members of the chapter for the enjoyable ceremony and all the members of the chapter who had been involved in the ceremony for their work that evening. Christopher then presented Colin with three cheques on behalf of the chapter for charities totalling £450. £250 for the MCF 2021 Festival, £100 to the WLFC and £100 to Tithebarn, Colin, on behalf of the recipients, thanked the companions for their generous donations. At the end of the ceremony Colin had the privilege to deliver a description of the Supreme Grand Chapter certificate to Paul Robinson, before it was presented to Paul by Christopher. Following the convocation the members and guests retired to enjoy the delights of the friendly and jovial festive board. Pictured from left to right, are; Malcolm Alexander, Graham Chambers, Colin Jenkins, Chris Cullen, Dean Scrutton, Paul Rooney, Barry Dearden and David Coulson.